My copy of Otaku: Play came in the mail today, fresh from Romania. That in itself is a bit of a story. So yeah, ordering things from Romania makes your banking security go crazy. Be prepared for a disabled card, alert emails, and having to spend a good hour on the phone explaining to them that it's really you and you did mean to order that magazine from Romania! But I digress. The magazine is fantastic. It is an amalgamation of all things otaku. 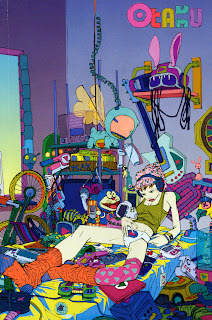 But more importantly, its primary focus is on art based out of otaku sub-culture. 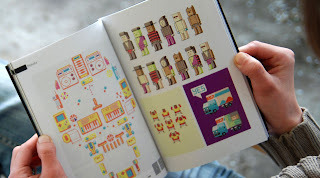 The first section of the small form-factor magazine showcases several artists from around the globe. Additional pages bring in product, music, indie games, anime, and film reviews and previews. The second half of the magazine is filled with indie manga by various creators. I haven't yet read through all of it, but the artwork is excellent. I'm very much looking forward to reading Jump! by Between and Inkamon in particular. 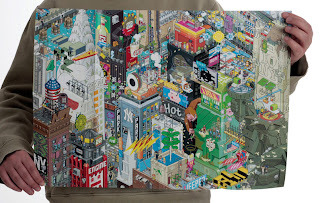 As a bonus, the magazine comes with a poster, in this issue a large pixel art scene of New York City, and a DVD. The disc is chock full of chiptunes, videos, and indie game previews. All good stuff. In a way, you might say that Otaku magazine is a primer for all things otaku. And even with the international shipping, the $23 price tag is well worth it. Just be quick, as they only print a limited quantity, with a mere 350 copies of this issue!